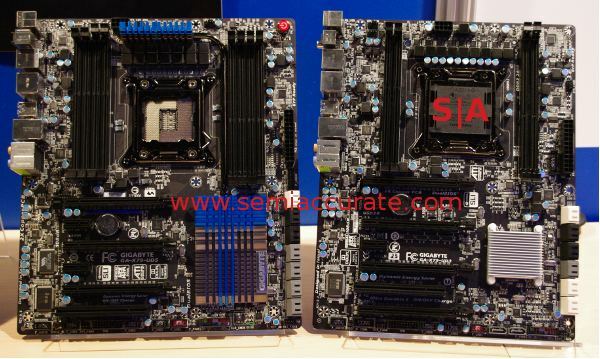 Gigabyte was showing off not one, but four X79 based boards at IDF. For enthusiasts, the next big thing is coming soon after a long long delay. In case you have been under a rock for the last two years, the Sandy Bridge based upgrade to the X58/Westmere high end server/gaming parts from Intel has been completely MIA. What was supposed to be a fall 2010 product is now a winter 2011 product, and not quite fully baked at that. While my fears about the quality of the shipping Sandy-E chip have been pretty much assuaged, the whole thing is turning in to a rather uncharacteristic stumble for Intel. Luckily, the boards and the chips that Gigabyte are showing off are really cool, and have none of the hiccups that the CPUs do. Above, you see the two ‘low’ end parts, if any X79 board can be low end. On the right you have the GA-X79-UD3, the ‘value’ board. It has 8-phase power, CrossfireX/SLI support, PCIe3 support (Sort of, but that is Intel’s fault, not Gigabyte’s. The boards work just fine. ), USB3 ports aplenty, and SATA6 support, and Dolby sound. This is on top of the normal goodies that the socket 2011/Sandy-E platform brings, like four memory channels. Moving up from there, we have the GA-X79-UD7 on the right, and the G1.Assassin 2 on the left. The UD7 is, wait for it, a step up from the UD5, and it delivers the goodies. This one has 20-phase power delivery and support for 4-way CrossfireX and SLI, but only four DIMM slots. Once nice touch is that the PEG power delivery is beefed up for OCing GPUs, so if that is your passion, this might be useful. The nice stuff is in the added features, OC Touch, OC Cooling, and OC DualBIOS. Touch is a marketing name for the seven buttons in the top right, power, clear CMOS, two sets of faster/slower buttons, and a blue one that we don’t have a clue about what it does. It is blue though. OC Cooling means there are seven 4-pin fan headers so you can play with cooling settings until you get bored, and the OC DualBIOS lets you set your OC settings, and swap back when things get ugly ala recent ATI cards. The only thing this board lacks is 8 DIMM slots, but that will probably happen in the next rev. The G1.Assassin 2 is something similar to a UD6 board with a lot of extra goodies. It is made for gaming, not OCing, but it will probably OC fairly well too. It has 8-phase power with all solid Japanese caps and other similarly high quality components. 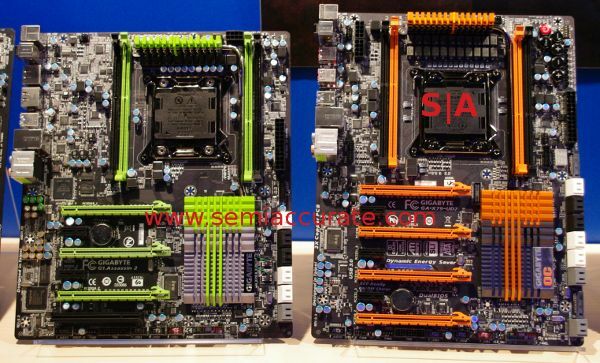 There is support for 3-way CrossfireX and SLI, along with 4 DIMM slots. The ‘extra’ features that this board brings are nice, a full hardware Creative X-Fi chip with Nichicon MUSE audio caps, and a Bigfoot Killer NIC E2100.